Young guys these days, they think they're indestructible. Derwin was walking round town last week (28 degrees! And windy!) in just a corduroy jacket. He did have a very cool scarf (more on that later*) to help keep him warm, but action needed to be taken. After all the women in the office got all "Derwin!" on him, I was able to drag him down to 34th Street. We started at Daffy's as they had loads of Triple Five Soul just the other day. But by the time Derwin and I got to Daffy's, there was nary a one in sight. I'm impressed with the shopping temerity of the midtown man. I've bumped into the same fashionable young man trolling Daffy's aisles on several occasions. He's stiff competition. But, as the fashion fates would have it, Derwin was meant for Italian wool instead. He bought a 3/4 length, hooded navy wool. We did a little comparative shopping, but anything comparable in quality was pricey. 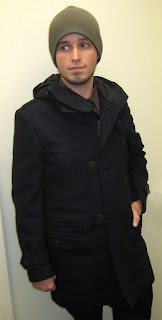 Young men in their early 20's are not allowed to spend hundreds on winter coats. That's why God gave us Daffy's. Beautiful, right? When you can, go with the Italian. This coat is by Gazzarrini, or, per Derwin's moniker, the The Great Gazzarrini. Great quality and great looks for $139.99, it is magic. 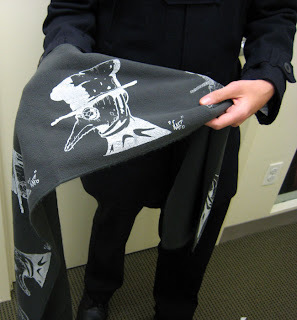 *And check out this, right: Derwin buys scarfs on the street and silkscreen prints his original designs.